Three Days in Richmond, Virginia – Wow! Despite a rainy start, what a glorious three days we had in Richmond last weekend. David offered me a getaway Mother’s Day weekend in the area of my choice … Paris and Prague were out of the question, however. We’d only ever visited Richmond in the past for business … airport, hotel, customer meeting, hotel, airport … not much in the way of touring involved. So Richmond was my choice … just over 100 miles northwest of Chesapeake … and a great choice it was. Of course, I did my homework before leaving. We filled every minute with something to see or do and could have spent another week and still not have been bored or seen it all. Despite my research in advance, we stopped at the Visitor’s Center and picked up brochures and some pointers from the local volunteers. We were really impressed with this museum … its size, its collections and the way in which the artwork was displayed. Admission is free. Garage parking was a nominal $5 for the day. The highlights for us were two special collections … Captivated by Color … a collection of Indian art and paintings (as in from India) and a collection of Faberge Easter eggs designed and fabricated for the Russian czar Nicolas II and Alexandra, his wife. Faberge Easter eggs for the Russian czar, Nicolas II and Alexandra. There was lots more to see in several galleries... an interesting collection of horse paintings and a sculpture of Chrismas Goose, owned and ridden by Paul Mellon; beautiful stained glass work by Louis C. Tiffany as well as Jacques Gruber and a most amusing George Catlin oil entitled “A Long Speech”. What a grand, grand building this is, sitting high and noble on the top of Shockoe Hill. Designed by Thomas Jefferson, it is said to be “one of the 10 Buildings that changed America”. The hour-long tour is free and very comprehensive or you can take a self-guided tour and wander around this gorgeous building yourself. Metered on-street parking is free on weekends. Classical Revival Temple style of the Virginia State Capitol building designed by Thomas Jefferson. Established in 1847, this 135-acre cemetery lies peacefully midst rolling hills, narrow roads, winding paths and thickets of trees and holly bushes overlooking the James River. Two US presidents, James Monroe and John Tyler, as well as the only confederate president, Jefferson Davis, are buried here along with several Confederate generals, notably J.E.B. Stuart and George Pickett. James Monroe's monument is top center; Jefferson Davis left center. The rows of Confederate graves are heart-wrenching, as is the huge pyramid memorial to the Confederate dead. Visitors are welcome and brochures are scarce, but we were able to pick one up at the Visitor’s Center. It’s easy to take a self-guided tour (walk or drive) though guided tours are available. There is also an on-line guide to identify the location of the most notable graves. There are also public concerts held here on occasion and, of course, there’s still room for more new “residents”. The most touching marker was the faithful "Iron Dog" standing sentry over a child's grave. General Stonewall Jackson was shot by friendly fire in 1863 and died a few days later. Richmond's Monument Avenue is the only street in the USA to be designated a National Historical Landmark. This lovely boulevard lined with stately mansions is dotted with statues of Confederate Civil War heroes including Jefferson Davis, JEB Stuart, Robert E. Lee and Stonewall Jackson, as well as famous Virginians like Matthew Fontaine Maury, “Pathfinder of the Seas”. There’s also a statue to Richmond’s own native son, tennis player, Arthur Ashe. It’s a lovely drive. There are statues gracing nearly every square and colorful murals are everywhere you look in Richmond … eye candy for visitors and locals alike. While driving around town, we saw several murals and statues, but if we’d had more time, we’d have searched out more. The Richmond Mural Project provides photos and locations for those interested. Richmond boasts a lively restaurant, cafe and craft brewery rich environment. There were certainly no dearth of restaurants available. We literally stumbled upon the Penny Lane Pub. We were hungry for lunch, found a vacant parking spot on a side street, looked up and saw the sign. We were greeted by Terry O’Neill, the Irish proprietor, took a look at the menu and couldn’t help but fall in love with the place as soon as we walked in. It was raw and chilly and Terry seated us beside the blazing hearth. The fire, David’s black and tan and my draft cider warmed us up considerably and we enjoyed a relaxing, excellent lunch in a convivial atmosphere. We highly recommend this restaurant for good pub food, friendly service and kiss on the cheek from Terry on the way out. Rated as #4 in the USA, we visited the Lewis Ginter Botanical Gardens just as they opened on Sunday morning. It was sunny and clear and the Mother’s Day crowds had not yet arrived. The sprawling 50 acres is lush and verdant as you’d expect, with lovely winding paths to wander, a healing garden, fountains, a wonderful treehouse for kids (and adults, too) a never-ending variety of flowers to sniff and walkways and bridges over the lake to tiny islands. We visited the Butterfly Pavilion which was awesome. The tropical plant exhibit in the Conservatory had a dazzling display of orchids. A tiny thatch roof cottage with an English garden display was delightful. We stopped for a cup of tea in the Tea House and thoroughly enjoyed the interesting and unique offerings in the gift shop. Great place to visit. The butterfly pavilion was delightful. Richmond, as the Civil War capital of the Confederacy, offers a significant look at history not only through Southern eyes, but through the eyes of the North, African-Americans and the women left behind to carry on when their men went off to war. We visited the remains of the NPS- operated Tredegar Iron Works, responsible for supplying the South with guns, munitions and iron products during the Civil War. There are several other sites in the area including the Chimborazo Hospital that would have been great to visit, but as always, time dictated our schedule. 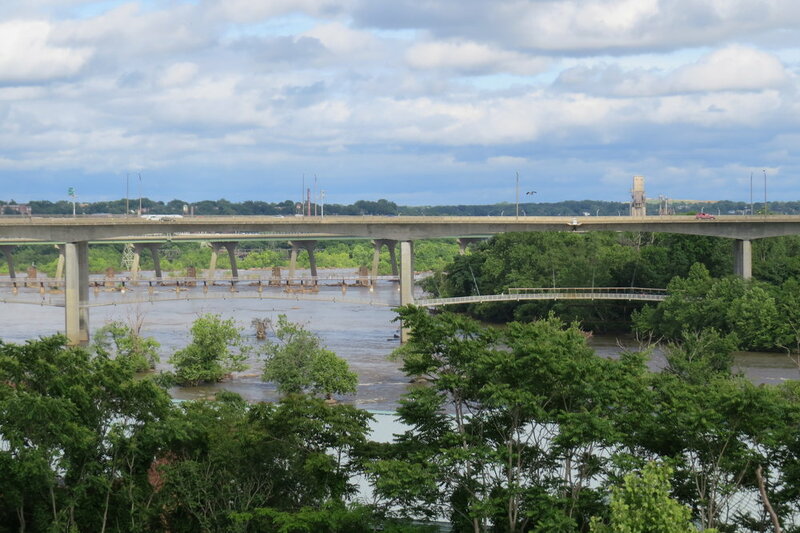 Across the street from Tredegar lies the James River. This portion of the river is shallow, rocky and offers Class IV rapids. There are catwalks and walkways above the river which lead to several small river islands. We only walked a short way in the heat of the afternoon before determining early morning might be the best time to tackle the walk with less heat and smaller crowds. Awesome views though. This museum is listed as a fun, unusual thing to do and I was excited to visit. The museum is housed in “the oldest house still standing in Richmond”, circa 1737 and the house is interesting, but Poe never lived there. For the most part, the museum is not that interesting at all. No photos are allowed inside and the displays are tired, uninteresting and the informational placards contain several typos (a personal pet peeve). We did learn something interesting about Poe, however. We’d been taught that he was a womanizer and drug addict and died of an overdose. This, however, isn’t true, but was a lie promulgated by his archnemesis, Rufus Griswold. Two black cats, Pluto and Edgar, wander the grounds which is kind of cool. The gift shop has some interesting souvenirs for sale, but all in all, we could have given this museum a pass and not missed much. As always, I have a few odds and ends we enjoyed during our visit that we thought we'd share. We missed seeing quite a bit … Maymont, a plethora of historical sites, local neighborhood sights, churches, more museums … and those are only the places we know about. We wonder what hidden gems are waiting to be discovered. There’s a reason that Richmond was #3 in Travel + Leisure’s 2016 best places to travel. We’d go back again in a heartbeat!